This paper presents a guided tour system for the WWW. It is a module for the Webvise open hypermedia system that implements the ideas of trails and guided tours, originating from the hypertext field. Webvise appears as an open hypermedia helper application to the user and stores the guided tours in an XML format called OHIF separated from the WWW documents included in the tour. The main advantages of the system are: (1) a browser independent format in terms of HTML and PNG-based image maps for reading the guided tours; (2) support for a familiar metaphor namely, a metro route map; (3) overview maps and route maps with indication of which stations of a tour have been visited; and finally (4) support for arbitrary web pages as stations on the tour. The paper discusses the Webvise Guided Tour System and illustrates its use in a digital library portal. The system is compared to other recent Web-based guided tour systems, and it is argued that Webvise Guided Tour System solves a number of prior system problems. 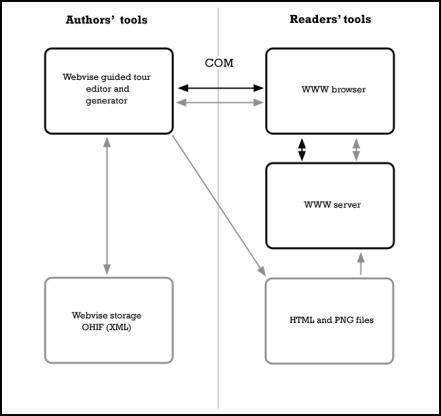 This paper presents a guided tour editor and generator for the WWW , which has been developed as an integrated part of the open hypermedia system called Webvise [8,9]. The generated guided tours can be used by readers in plain browsers without using Java or any plug-in. The notion of a guided tour has become quite common on the Web; the search terms "guided tour" gave in February 2001 more than 450.000 hits on Google (www.google.com). Many of these hits actually represent sites that present a certain topic in a sequence of web pages and commented links like, e.g. the guided tour of the Visual Human (www.madsci.org/~lynn/VH), guided tour on Wind Energy (www.windpower.dk/tour) and the Chalmers Library guide (educate2.lib.chalmers.se/demopath.html). Only few of these guided tours are made by a dedicated guided tour system. Most of them are created manually in plain HTML with some 'next' and 'previous' links at the top or the bottom of the page. It has, however, been demonstrated by a number of recent systems that it is useful to use a more explicit guided tour facility to present information on the WWW [5,11,13,15]. Teachers, librarians, Web journalists, portal editors, publishers, governmental administration etc. often wish to present procedures or collections of information in a homogeneous manner. Among the systems explicitly supporting guided tours for the Web are: Pooh's Guided Tours Service , Footsteps , Walden's Paths , and Ariadne [12,13]. All of these systems provide value-adding services for the WWW making it easier for the prospective users of the WWW to find their way through relevant information. Moreover open hypermedia systems have been developed to allow users to create their own links and annotations as external hypermedia structures to help the users of the WWW to create their own ways of organizing bodies of materials to be communicated to others or re-used at later stages. Much research and development has already been made to add external structures to the WWW, such as links and collections. Examples are Hyper-G/HyperWave , DHM/WWW , Microcosm DLS , and Webvise [8,9]. The Webvise system is a full-blown open hypermedia system, which has been extended with an integrated guided tour editor and viewer as well as a generator to export guided tours in plain HTML and PNG formats for access through a browser only. The Webvise Guided Tour System is inspired both from the classical hypertext research [2, 3, 10, 19, 21] and the recent initiatives on the WWW mentioned above, and it attempts to take further steps in the direction of supporting users in navigating through prepared presentations of subjects. In addition to inspiration from the classical hypertext systems we have been inspired from the ideas of simplified metro or bus maps to communicate information on routes in a complex city. This idea came across when our pilot users pointed us to a handcrafted library web page at Chalmers, Sweden (educate2.lib.chalmers.se/demopath.html). Previously, the Webvise system was developed by Mjølner Informatics (www.mjolner.com), and the Opasia version of Ariadne was developed by TDC (www.teledanmark.dk). 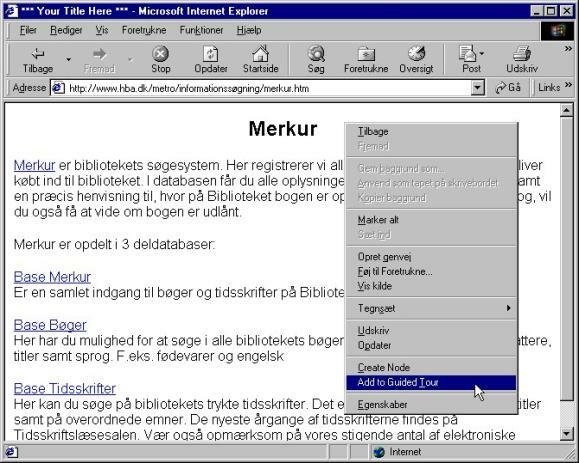 In December 2000, the Webvise and the Ariane technologies was moved to a spin-off company Hypergenic, jointly formed by Mjølner Informatics and TDC. Hypergenic is responsible for combining and further developing these two complementary technologies into one product family. The Webvise system including the Guided Tour System as described in this paper is available from www.hypergenic.com for free trial. Arbitrary pages can be included in the guided tours without need for pre-processing on access time. To take full advantage of the structure of the open hypermedia based guided tour, the user should be able to view the relevant part of the tour while following a route. The user should be able to monitor the stations in the tour that have been visited and where the user is currently located within the tour. Finally, the author of a tour should be able to help the user by adding names or/and annotation to the stations. This is supported in the Webvise Guided Tour System. It helps users keep their orientation in the tour, e.g. if the user has lost orientation because s/he has gone off the tour by following links from a page in the tour, a quick look at the graphical presentation of the tour helps the user regain the focus. The annotation support gives the author the possibility to add comments about Web pages within the tour. This can be used in a variety of use situations, e.g. if the author wants to review the sites in the tour, draw the readers attention to a specific topic in the page or — in an educational situation — adding questions to the topics touched in the page. This section presents the metro map metaphor and shows an example of how it has been used in a user guidance system at the Library at the Aarhus School of Business. We present a metro map and one of the route maps that are generated from the Webvise guided tour editor. The generated metro and route maps can be visited at www.hba.dk/metro. Usage of the metro map metaphor in guided tours has shown to be an efficient technique for providing overview over a set of web documents because the metaphor is intuitive and simple. Many people around the world know how to read route maps for metros or busses. Given the destination station it is easy to find which route to take even in large cities like Paris and London. Designing metro maps in the real world is, however, not a simple matter [6, 20], and it is not either simple on the Web, where we don't have a fixed underlying map of the structure to traverse similar to a city map. But we provide a general tool that allow map designers, i.e. the domain experts, a large degree of freedom in the design of simplified maps of arbitrary complex underlying structures. The main idea in using the metro map metaphor in guided tours is to consider each major subject in the web information as a route in the metro map. When the reader wants to know something about a certain subject s/he just has to “take the metro” on the route that deals with that subject. If the reader is very unfamiliar with the subject s/he should start at the central metro station whereas more experienced readers can enter the metro farther out on the route (see Figure 1). Hence, metro maps are used to provide overview when entering the information infrastructure by showing an overview over all routes. But the metro map metaphor has more to give. Inside the real metro wagons a horizontal route map is shown with all the stations on the route, and every time the metro stops at a station the traveler can see where s/he is on the route, which stations have already been visited, and which stations are yet to be visited (see Figure 2). This has inspired the presentation of a route map above the web document that is associated with each station as will be shown in the following. The different routes in the map present different recommended ways through the user guidance system. Each route represents a certain topic. The topics are: literature, library orientation, study guidance, project writing, Internet, vocabularies, writing laboratory, virtual libraries and information retrieval. If the user wants to follow the recommended sequence s/he just has to click on the oval figure of a route. Otherwise s/he can jump directly to a particular station by clicking on it. When clicking on a station in the metro map, a route map will be shown together with the contents of the particular station. If the ‘Merkur’ station is selected in the yellow route (‘Informationssøgning’) the frameset in Figure 2 is presented. The frameset consists of two frames: a navigation frame and a contents frame. The navigation frame shows the selected route and the position on the route by red coloring of the preceding and the current station. The contents frame shows the contents of the current station, i.e. the URL that the station represents. In the upper left corner of the navigation frame there are 4 navigation buttons: navigates back to the metro map, selects the preceding station, selects the following station and is called: ‘back on route’ and is used when the user has followed the links in the contents frame and wants to return to the URL of the current station. And finally each station can be selected directly by clicking on it. This section describes the architecture and the user interface of the Webvise Guided Tour System. Figure 3 shows the architecture of the Webvise Guided Tour System. It consists of two major parts: the readers’ tools and the authors’ tools. Figure 3: The architecture of the Webvise Guided Tour System. Black boxes denote applications and gray boxes denote data storage. Black arrows denote control flow and gray arrows denote data flow. The readers’ tools consist of the usual WWW browser and server components. The WWW servers are ordinary servers holding the WWW documents, which are accessed solely by the WWW browser. The authors’ tools consist of the Webvise guided tour editor and the Webvise guided tour generator. The guided tour editor lets the user build the guided tour by selecting the relevant WWW documents in the WWW browser. The communication between Webvise and the WWW browser is via COM. This is described in further detail in . The guided tour generator generates browser-independent HTML and PNG files from the guided tour. Finally the guided tour is stored in OHIF format. As mentioned the OHIF format is based on XML and it is a very convenient representation of the guided tour. The XML representation is open for exchange with other applications and it allows for a variety of different presentations of the same structure. An excerpt of the OHIF file for the Metro Map at the Aarhus School of Business is shown below in Figure 4 (the station ’Merkur’). As can be seen the representation contains structural as well as layout information. The guided tour editor is a drawing editor that makes it possible to define the sequencing of stations in the guided tour in a general graph. Stations can be added to the graph in different ways. One way is shown below (more facilities are described in detail ). Figure 5: Adding an URL to the guided tour by using the command ‘Add to guided tour’ in an extended popup menu of the Internet Explorer. In Figure 6 the almost complete guided tour of Aarhus School of Business is presented. Connecting stations in a route is done by holding down the 'ctrl'-key while dragging with the mouse from a node to the next node in the sequence. Figure 6: The guided tour editor showing how a route is drawn between stations (the pencil drawn from the ‘Merkur’ station in the ‘Informationssøgning’ route). The guided tour editor is also a navigation tool. The five leftmost commands in the toolbar are for navigation. This functionality was also present in Webvise as presented in  and was inspired from the classical NoteCards system [10,19]. The new contribution described in this paper is usage of the metro map metaphor and full browser independence via generation of HTML and PNG from the guided tour editor. It is possible to write annotations to the stations. If a station has an annotation it is shown in the annotation pane of the guided tour editor. In the generated web documents, an annotation is shown in a tool tip that pops up when the mouse pointer is held over the station in the metro and route maps. The layout commands make it possible to choose fonts, define text slopes, choose colors of the background, stations and connectors etc. Furthermore, it is possible to include simple graphical symbols like lines, rectangles, ovals and text boxes. Finally, bitmaps can be inserted either as simple graphical elements or as an alternative presentation of stations. In Figure 6 the logos at the lower left corner and the bitmap in the center are simple bitmaps and the ovals are stations that are represented with a bitmap. The HTML generation commands work like follows. The ‘Metro’ command generates the metro map, i.e. a PNG file with the contents of the graphical window and an HTML file with an image map that maps the positions of the stations in the PNG image to the corresponding frame sets with a navigation frame and a contents frame as described earlier. The ‘Create route’ command is used as follows: If all the stations that belong to a route (and other graphical symbols that should be present in the route navigation frame) are selected, this command opens a new graphical editor that is called a route editor (see Figure 7). Figure 7: The route editor showing how to change the font of all the station names. In this window the layout of the route navigation frame is prepared. A default layout of the route is automatically generated: the route is horizontal, the distances between the stations are equal and the text angle is 45 degrees. However, the user can change this layout as s/he likes. Regarding layout facilities, the route editor is identical to the guided tour editor. In the screen dump above all the stations of the route have been selected and the ‘Font’ command is about to be selected. In addition, the navigation buttons (as described earlier) are inserted automatically. The user may place them anywhere in the window or delete some of them. When the user is satisfied with the layout, the ‘Generate route frames’ command is used to create the framesets that correspond to a route. The generated framesets are as follows. For each station a frameset and a PNG file are generated. The frameset consists of a navigation frame and a contents frame. The navigation frame refers to a PNG file that shows the contents of the route window. However, the stations and the connectors preceding the current station and the current station are drawn in red to indicate the position in the route. That is the reason why a separate PNG file is generated for each station. The contents frame simply refers to the URL that was associated with the station when it was added to the guided tour. In this section, we provide a more detailed comparison of then Webvise Guided Tour System with the main existing guided tour systems for the WWW. Adds annotations (PGTS and Walden's Paths). · Increased Internet traffic — all web pages are retrieved first by the tour server then in turn sent to the user's client. Pre-processing limits the browser's navigational options: Bookmarks, Home, Open Location etc. will not access the tour server. Use of these operations will terminate the traversing of the tour. Lack of overview of the tour — The systems gives only a limited overview of the stations and their relationships within the tour. Only linear tours are supported. Ariadne [12,13] and the Opasia Portal version of Ariadne  is based on a Java applet that maintains the graphical representation of the guided tour in a separate panel together with the navigation buttons and annotation. Ariadne solves most of the problems that the pre-processing systems have with respect to inserting code in the content pages developed by others. The Ariadne applet retrieves its guided tour structure from the server when loaded, and all the control of the guided tour is maintained at the client side, with no interventions in the pages constituting the stations of the tour. Ariadne was in its initial form both an editor and a viewer for guided tours. In the Opasia Portal variant there is only access to a viewer interface – the editor is only available to the portal designers. It is not possible to bookmark a page in a tour and return to this page within the context of the tour later. Ariadne occupies more screen space for presenting the guided tours. The final system to mention is the Webpath prototype  that is a special purpose guided tour web browser developed in Microsoft Visual Basic reusing the HTML component of the Microsoft Internet Explorer. This system does not have the problems that the pre-processing systems exhibits since the special-purpose browser handles the control, and it reduces the Ariadne screen estate problem by adding the guided tour as a kind of toolbar in the browser (it only supports linear tours). However, having to live with a limited function special purpose browser for guided tours is not acceptable to many users. Thus the only prospects of a solution like this, is if it becomes an integral part of future full-blown browsers. The Webvise guided tour system can, on the one hand, be seen as a Helper Application system which is tightly integrated with the Internet Explorer and enables users to edit guided tours as arbitrary lattices (corresponding to Metro Maps) of connected stations. The guided tours can be traversed by the Webvise application supporting the same functionality as Ariadne with respect to navigation, reading of annotations, and maintenance of overview of visited stations. In this mode of usage it shares the benefits of Ariadne, and even goes beyond that in the level of control of the browser that is available through Microsoft COM. On the other hand, Webvise can be used to generate the guided tours as a standalone (sub-) website (conforming to the Metro Map metaphor described earlier) consisting of framesets and image maps generated as PNG files. This guided tour collection of web pages can be used from a plain browser with no need for pre-processing as required by the pre-processing class of systems discussed above. Moreover, the pages can be bookmarked within the guided tour context, and the route map navigation frame occupies only little screen real estate, which is comparable to Walden Paths [5,18], one of the pre-processing systems. A weakness of the Webvise generated guided tours, compared to Ariadne, is that we cannot provide specific support for the users to get back on a guided tour if they leave it from a link in a page or jump to a bookmark. Then the user has to find back to the guided tour by means of the standard browser ‘back’ button or history lists. A related weakness of the Webvise generated route maps is that the route map disappears if the contents page contains scripts that specify that the contents page should be the root window. We also share the general frame problem that usage of frames in the contents pages may in some situations cause conflicts with the frame structure of the guided tours. One example is that it is not possible to specify a station that corresponds to an internal page frame. This is possible in the Guided Tour editor, but not in the generated pages, due to limitations in the current browsers. Finally, compared to the examined guided tour systems on the WWW only the Ariadne system provides support beyond linear tours, i.e. authors of tours in the other systems cannot create a tour that contains branching routes. If an author of a guided tour wants to create a tour where the readers should be able to choose, e.g. between different subtopics, this would be difficult only having support for linear tours. If the author would like to create two different sub tours in a tour, e.g. one describing a problem in detail and one just giving the reader an overview of a topic, the branching option would be handy. The author using the Webvise Guided Tour System can create branching routes in an easy way, and having it supported with a familiar metaphor namely the Metro Map metaphor. This paper has presented a new guided tour system, integrated in the Webvise open hypermedia system. The Webvise guided tour system consists of an editor/viewer helper application and a generator to create a stand-alone guided tour website consisting of only HTML and PNG files, which can be used through plain browsers. The main advantages of the system are: (1) a browser independent format in terms of HTML and PNG based image maps for reading the guided tours; (2) support for a familiar metaphor namely, a metro route map; (3) overview maps and route maps with indication of which stations of a tour have been visited; and finally (4) support for arbitrary web pages as stations on tours. The status of the Webvise guided tour system is that it is now an integrated part of the Webvise system, which is being developed and used for a number of portal projects on a consulting basis by Hypergenic. (www.hypergenic.com). The Metro Map based guided tours have been in use at the Aarhus School of Business since September 2000 (www.hba.dk/metro). The guided tours have been used as basis for introducing all first year students to library use and information search. In addition the Metro Map is the start page on all PCs (70) in the Learning Resource Center with 1250 students and 130 teachers. The response is very positive from the students as well from the teachers and the Aarhus School of Business is planning to use the approach in other domains beyond library introduction. A new route ‘Courses’ with a station for each course is currently being developed in collaboration with the teachers and the use of the system is by teachers as well as students expected to increase in the future. A logging mechanism is being established to analyze user behavior but at the time of writing we do not have any real numbers to establish an analysis of the usage. Since there exist two pages for each station on the routes: the original contents page and the generated html page, it is e.g. possible to measure the frequency of traditional access to the contents pages (via search or the original web structure) as well as the frequency of access via the Metro Map. The relationship between the two frequencies over time will give a measurement of the usage and thereby usability of the Metro Map. The Metro Map at the Aarhus School of Business has been further developed since the start and is continuously being changed in order to deal with new needs. There are primarily 2 users responsible for development of the maps, and they have roughly increased the size of the map overview with 50 % since the system was delivered. New routes have been added and others have been restructured based on user experiences. The Metro Map has been compressed using smaller fonts and smaller graphics in order to be fully visible on smaller screens, and some of the routes are only represented with one graphical symbol on the Metro Map, but with the full route on the route map. The latter technique for compression had not been designed deliberately into the system, but the users “discovered” this functionality by utilizing the fact that only the visible part of the Guided Tour Editor window is being written to the PNG file. We are collecting qualitative experiences from these portal projects and using those as input to improvement of the system functionality and user interface. An example of an improvement inspired from these experiences is that some users prefer to get the author’s comments on a station as part of the route navigation frame instead of as a tool tip, which only appears on mouse-over on the station. Since the Webvise system is a full-blown open hypermedia system, we are looking into several possible extensions of guided tours based on open hypermedia linking and annotation facilities, which are already supported in the original Webvise system. Challenges are here to get them to fit nicely into the chosen metaphor, and to provide browser independent support for local annotations and external links similar to what is possible with the generated guided tours. Another likely development of the Webvise Guided Tour System is to look into other metaphors for the graphics of the guided tour depending on the application domain and not limiting it only to Metro Maps. For genealogy we may use inheritance tree metaphors and for competitions or treasure hunt games on the Web we may e.g. apply a maze metaphor for the graphics of the tour. In such cases, the term ‘guided’ for the tour will of course become questionable, and will have to be replaced with a more appropriate terminology. 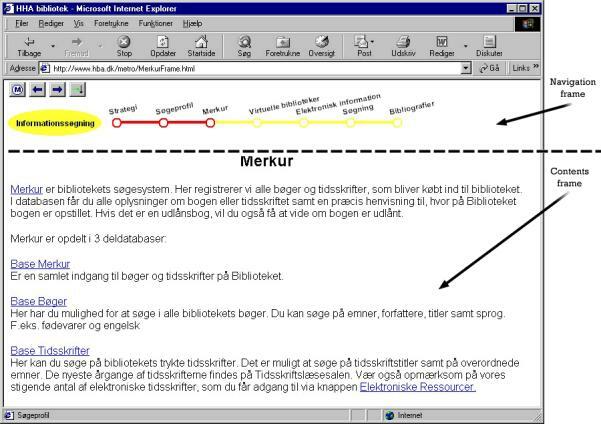 The Metro Map metaphor was inspired by the Chalmers Library guide (educate2.lib.chalmers.se/demopath.html) and part of the development of the Webvise Guided Tour System was developed by Mjølner Informatics (www.mjolner.com) under contract with the Library at the Aarhus School of Business (ASBL). We wish to thank the following people at ASBL: Tove Bang and Per Steen Hansen for setting up the project, and Finn Nyborg and Birgitte Eltzholtz who were our first pilot (author) users. They inspired our development of support for the Metro Map with useful feedback in a highly iterative development process. Finally we wish to thank Jacob Seligmann for proofreading the paper. T. Berners-Lee, R. Cailliau, J. Groff, World Wide Web: the information universe, Electronic Networking Research, Application and Policy, 1(2): 52–58, 1992. V. Bush, As We May Think, The Atlantic Monthly, 76: 641–649, August 1945. V. Bush, Memex II, 1959, in: J. Nyce and P. Kahn, (Eds. ), From Memex to Hypertext: Vannevar Bush and the Mind's Machine. Academic Press, 1991. L. Carr, D. De Roure, W. Hall and G. Hill, The distributed link service: a tool for publishers, authors and readers, in: Proc. 4th International World Wide Web Conference: The Web Revolution, Boston, Massachusetts, USA, 1995. R. Furuta, F.M. Shipman III, C.C. Marshall, D. Brenner and H.-W. Hsieh, Hypertext paths and the World Wide Web: experience with Walden's Paths, in: Hypertext '97 Proceedings ACM, 1997, pp. 167–176. K. Garland. Mr Beck's Underground Map. Capital Transport Publishing. 1994. K. Grønbæk, N.O. Bouvin and L. Sloth, Designing Dexter-based hypermedia services for the World Wide Web, in: Hypertext '97 Proceedings ACM, 1997, pp. 146–156. K. Grønbæk, L. Sloth, & P. Ørbæk. Webvise: Browser and Proxy support for open hypermedia structuring mechanisms on the WWW. In Computer Networks – The International Journal of Computer and Telecommunications Networking. Vol. 31. 1999, pp. 1331-1345. F.G. Halasz, T.P. Moran, and R.H. Trigg, NoteCards in a nutshell, In: Proceedings of ACM CHI+GI'87 Conference on Human Factors in Computing Systems and Graphics Interface, 1987, pp. 45–52. 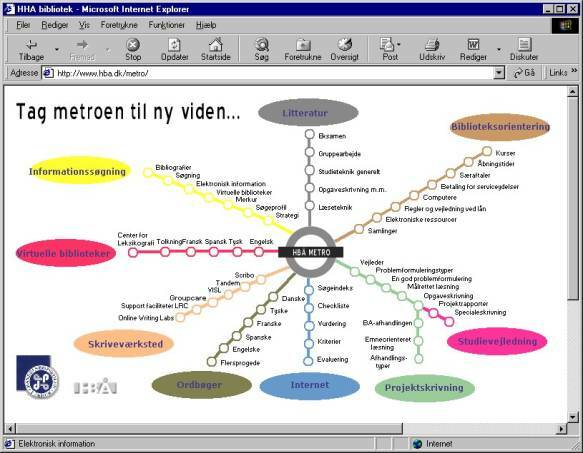 A. Jensen and J. Jühne, Udvikling af en stimekanisme til WWW, Department of Computer Science, University of Aarhus, 1997. J. Jühne, A.T. Jensen and K. Grønbæk. Ariadne: a Java-based guided tour system for the WorldWide Web. In proceedings of The Seventh International World Wide Web Conference (WWW7) Brisbane, Queensland, Australia, 14 - 18 April 1998. H. Maurer (Ed. ), HyperWave: The Next Generation Web Solution. Addison-Wesley, Harlow, 1996. D. Nicol, C. Smeaton and A.F. Slater, Footsteps: trailblazing the Web, in: Proc. of the 3rd International World Wide Web Conference, Darmstad, 1995. F.M. Shipman III, R. Furuta, D. Brenner, C.C. Chung, and H.W. Hsieh. ``Using Paths in the Classroom: Experiences and Adaptations,'' Hypertext '98: The Proceedings of the Ninth ACM Conference on Hypertext and Hypermedia, June 1998, pp. 267-276. R.H. Trigg, Guided tours and tabletop: tools for communicating in a hypertext environment, ACM Trans. Office Information Systems 6(4, October): 398–414, 1988. E. R. Tufte. Visual Explanations . Graphics Press. Cheshire, 1997. 156 pages. P.T. Zellweger, Scripted documents: a hypermedia path mechanism, in: Proc. ACM Hypertext '89, Pittsburgh, Pennsylvania, 1989, pp. 1–14. Elmer Sørensen Sandvad is software developer at Hypergenic, Århus, Denmark, and technical lead at Mjølner Informatics, Århus, Denmark. He finished his master’s degree in 1983 and his Ph.D. in 1993 from the Department of Computer Science, University of Aarhus, Denmark. His areas of interests are: Tools and techniques for object-oriented iterative system development and hypermedia technologies. Kaj Grønbæk is professor at the Department of Computer Science, University of Aarhus, Denmark. He is member of the board of Hypergenic. He finished his master's degree in 1988 and his Ph.D. in 1991 from the Dept. of Computer Science, University of Aarhus, Denmark. His research interests are: Hypermedia; Multimedia, CSCW; Interactive Workspaces, Participatory Design; User interface design; object oriented tools and techniques for system development. Lennert Sloth is software developer at Hypergenic, Århus, Denmark. He finished his master's degree in 1992 from the Dept. of Computer Science, University of Aarhus, Denmark. His areas of interests are: Design and development of hypermedia technologies. Development of graphical user interface libraries. Jørgen Lindskov Knudsen is managing director of Hypergenic, Århus, Denmark, and managing director of Mjølner Informatics, Århus, Denmark. He finished his master’s degree in 1982 and his Ph.D. in 1986 from the Department of Computer Science, University of Aarhus, Denmark. His areas of interests are: Object-oriented technologies, programming languages and environments, and graphical and user interface systems. URLs (from the Address field and links in the web pages) can also be dragged into the guided tour editor.